Great writing tips, thank you. 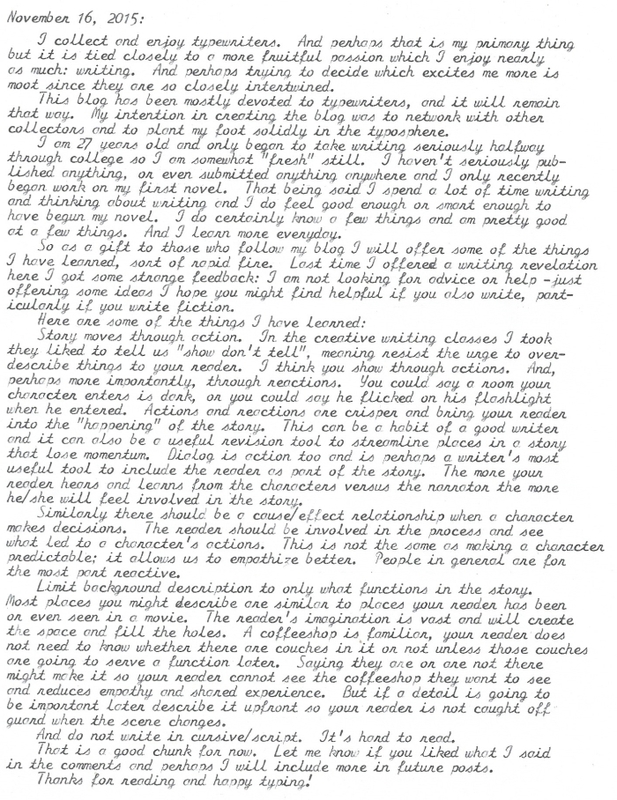 And I agree with the notion about cursive/script being hard to read; although this was still an enjoyable read, as I am drawn to anything typewritten. Unless you've had the opportunity to read some handwriting from the 1800s and early 1900s I fully agree with writing in cursive. I had the opportunity to read some old fire department records when I was active in a local fire department. All the records were hand written with a fountain pen or dip pen in bound books. The legibility was excellent. Can't say the same for my scribbles. Script on a typewriter though is quite nice. You bring out some good points on writing. Did you ever consider short stories for a magazine? I have written short stories, have never contributed anything anywhere serious. Might need to start doing that. I have been mostly working on my first novel though. Ted, I have a few machines not on the database. Mostly due to issues that have not yet been resolved. The Personal has some major line spacing stuff going on, but once that is fixed I will definitely add it.